The deputy communications director for the Minnesota Democratic-Farmer-Labor Party has now been suspended for just a week without pay for tweeting out a threat against Republicans, writing "bring them to the guillotines." 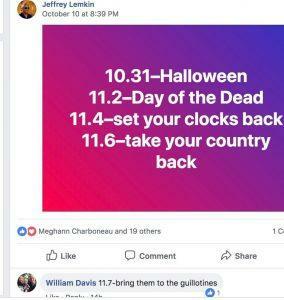 In response to a Facebook post that outlined dates at the end of October and the first part of November, William Davis responded with the threatening message, and yes, I consider it a threat since these people have not only shown their support for an alleged (and credibly alleged) woman abuser, Keith Ellison, but have also backed Islamic terrorists, Communists, Antifa and more. 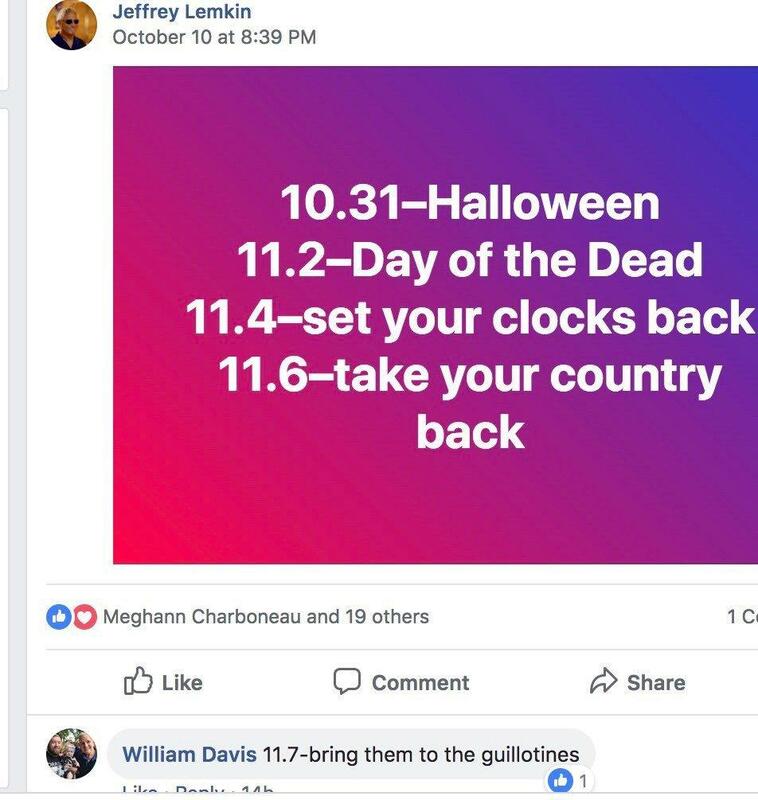 11.7 - bring them to the guillotines. He actually got one like! And where was Fascist Facebook in all of this? Crickets. "It is completely inconsistent with the standards we hold our employees to," DFL executive director Corey Day said of Davis' post. "I have spoken with Will and about our social media standards and our expectation that he use appropriate judgement when commenting and posting. He regrets the post and has deleted it." Yeah, OK, but apparently only for a week, right Corey? Those standards only apply for a week. Why wasn't he fired for this kind of rhetoric? Does anyone actually think it won't occur again? I'd say in light of what Day said next, in an apparent attempt to justify Davis' comment, the answer is yes, it will occur again. Day also said Davis' comment, in which he referenced the preferred execution method of the French Revolution, was "an inside joke among former co-workers." A spokesperson for the Republican National Committee, Preya Samsundar, said the comments made by Davis exacerbate a volatile political climate in which Republicans have been targeted with violence. "In a time where Republicans are being targeted for their stance on the issues, the comments made by the Minnesota DFL’s deputy communications director seemingly perpetuate the belief that violence against one’s opponent – especially if they are conservative – is acceptable," Samsundar said. Davis' comment came shortly after former Attorney General Eric Holder offered a revised version of Michelle Obama's "When they go low, we go higher," saying last week, "When Republicans go low, we kick them." Rep. Steve Scalise (R., La. ), who was shot in 2017 by a gunman targeting Republicans, said Holder's comments were a threat to democracy. "When Democratic leaders like Eric Holder call for violence, that is a direct threat to our democracy," Scalise said. "I hope [Holder] and others think long and hard about the world they are creating and the impact they are leaving on this country." Members of the DFL include lawmakers Sen. Amy Klobuchar (D., Minn), Rep. Keith Ellison (D., Minn) and Sen. Tina Smith (D., Minn.). An inside joke? Talk of murdering political opponents with a guillotine is what passes for jokes among Democrats? Let me let you in on something: It's not a joke, it's the plan. This is doing nothing more than citing insurrection. Davis should not only be given leave without pay and fired, he should be arrested for the threat itself. Next Franklin Graham: What Has Happened To The Democratic Party?